Rococo art is an 18th century style, which developed from the Baroque style. The both style differ a lot though. The baroque style was very heavy art with a church orientation whereas the Rococo style was playful, happy and drawn with light pastel colors. During the enlightenment the view about the human existence changed and the rococo visualized the optimism people felt to a respond to this. The style characterized curving forms, fanciful figures and the paintings had a cheerful mood, both visually and physically. The motives of many pictures were the relaxed outings of noble couples being out in the nature on picnics etc. The persons were often showed as optimistic and very happy. To be out in the nature and be related to nature was very modern during the enlightenment, thanks to Jean-Jacques Rousseau and his motto “Back to Nature”. 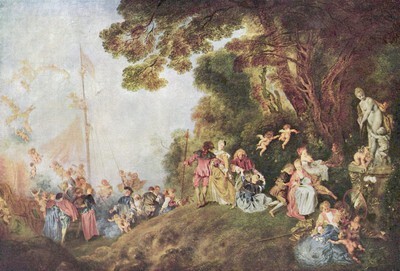 The paintings wanted to show a happy life without any worries, an artificial life with game playing and joy. One wanted to create snapshots out of a normal day, and make it look perfect. This to me sounds a bit silly; to show of a fantasy life that did not existed. However do the art’s motives really differ that much from the motives of today’s art? I would say they don’t. I believe the aim with the paintings were very similar to what we today want out of pictures. Because isn’t that exactly what we want, to take nice pictures but to make them look like they’re simply taken out of the moment. Depending on where and to whom we will show the pictures the motive can differ a bit, only to show the best side of us. And like during the enlightenment we want to portrait ourselves as happy and living a good life.